Price per McAfee ESM Appliance model. Built for big security data, McAfee Global Threat Intelligence for Enterprise Security Manager (ESM) puts the power of McAfee Labs directly into the security monitoring flow using McAfee’s high-speed, highly intelligent security information and event management (SIEM). This optional subscription service continually delivers and adjusts source reputations for over 140 million IP addresses — bringing the context of external system reputations directly into the security event stream — quickly identifying current and past interactions with known bad actors. McAfee Global Threat Intelligence™ for Enterprise Security Manager brings the power of McAfee Labs to enterprise security monitoring. For the first time, IP reputations—gathered by McAfee Labs from more than 100 million global threat sensors—are available to a security information and event management (SIEM) solution. This constantly updated, rich feed for McAfee Enterprise Security Manager enhances situational awareness by enabling rapid discovery of events involving communications with suspicious or malicious IPs. This allows security administrators to determine what hosts have communicated or are currently communicating with bad actors and to quickly identify conditions where a known bad actor was the source of threat activity. Immediately identify when any node on your network is communicating with a suspicious or known bad actor and quickly understand the threat’s path. Automatically incorporate IP reputation into the McAfee Enterprise Security Manager rule-less risk scoring algorithm, pinpointing the need to respond. Provide an accurate, up-to-date understanding of the global threat landscape even after compromised systems have been cleaned. McAfee Labs is constantly scouring threat information to detect newly infected and malicious systems. McAfee Global Threat Intelligence for Enterprise Security Manager puts the power of McAfee Labs directly into the security monitoring flow through high-speed, highly intelligent McAfee SIEM, which is built for Big Security Data. This optional subscription service continually delivers and adjusts source reputations for more than 140 million IP addresses, bringing the context of external system reputations directly into the security event stream and quickly identifying current and past interactions with known bad actors. McAfee Global Threat Intelligence (McAfee GTI™) IP reputation is derived from the correlation of threat intelligence from all major threat vectors, leveraging more than 100 million global sensors and more than 350 researchers. With McAfee Global Threat Intelligence for and Enterprise Security Manager, organizations now have the power to understand the IP reputation for any event, including heterogeneous firewalls, intrusion prevention systems, routers, and endpoints. Leveraging McAfee Enterprise Security Manager’s dynamic watch list capability, events are automatically associated with the source reputation score, and risk is adjusted. As global threats change, McAfee GTI keeps McAfee Enterprise Security Manager updated, ensuring that servers and systems continually have an accurate reputation score. This not only helps organizations understand risk, but also pinpoints urgent issues in real time, shrinking the incident response time window and providing accurate risk analysis. A core strength of McAfee Enterprise Security Managers is the ability to store, retrieve, and perform historical correlation over years’ worth of data. Now, with McAfee GTI, security analysts can go back in time, over years’ worth of data, to understand interactions with bad actors in the past. This is critical to detecting low and slow attacks, repeated activity from botnets, cross-site scripting, and SQL injection attempts. McAfee GTI integrates seamlessly with McAfee Enterprise Security Manager alarm and alerting mechanisms, ensuring that interactions with known malicious systems gain the attention they deserve. There’s been a lot of talk about data getting bigger, and that includes bringing the wealth of security-related knowledge of McAfee Labs to SIEM. McAfee Enterprise Security Manager is unique in its ability to store, correlate, and update the massive McAfee GTI IP reputation data store without unacceptable performance impacts. McAfee Enterprise Security Manager features a proprietary database that not only eliminates time-consuming database administration for SIEM, it also was specifically built for massive intake and processing of event and relational data at extremely high speeds. With McAfee Global Threat Intelligence for Enterprise Security Manager, customers can have confidence that McAfee GTI knowledge will be delivered in real time. 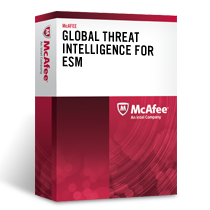 Download the McAfee Global Threat Intelligence for Enterprise Security Manager Datasheet (PDF).